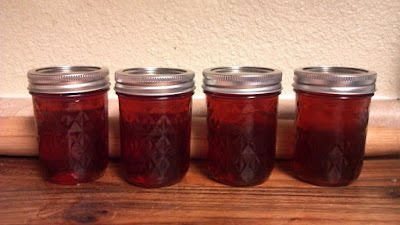 Spreading summer - Audrey's Sweet Tea Jam - Canning Homemade! One of the most popular drinks in the south is sweet tea. In some restaurants they don't ask if you want it sweet, it just is! My mom is from the south and I know that flavor very well so when I notice someone asking about making a jam I thought it was just a question, but didn't think that anyone would actually put it together. Audrey surprised me this evening with a variation of this infamous drink now in a spreadable form. Summer's most popular drink is now a jam for you to enjoy. From Audrey: "I've only had it on toast so far but biscuits would be great too. I make thumb drops, breads and popsicles from my jams. This would be great on chicken or pork too." for 12 hours but do not squeeze the bags when you drain them. Strain through a jelly bag or cheese cloth. In a dutch oven or stainless steel pot add the tea and turn the heat on high to get the tea simmering. Measure the sugar into a bowl and add the sugar all at once. Add the lemon juice and bring the recipe up to a boil for 1 minute. Add the liquid pectin, boil for 1 minute and remove from heat, skim any foam. In sterilized half pint jars, ladle in the jelly. Fill the jars to 1/4" headspace. Clean the rims and add lids and rings. Process in water bath for 10 minutes. Remove and let sit on a dish towel overnight. To make the popsicles from the jam: From Audrey: "I water down the jam and freeze it. Since it has sugar already added you don't need to do much to turn it into a popsicle. It depends on your jam and your tastes on how much you water it down."